Sovereign Grace Churches > Book Review: "Parenting First Aid: Hope for the Discouraged"
Book Review: "Parenting First Aid: Hope for the Discouraged"
I’ve always wanted to write a book on parenting. The dream has been real since before I had kids, but it was most alive when I had 4 kids under the age of 7. A short look at my family would have revealed a home where dad clearly knew what he was doing. I was a guy any wise person would want to learn from. That was my opportunity. I now have 6 kids ranging from 19 to 4 and the very last thing in the world I should do is write a book on parenting. You’d think the added experience would further qualify me, but that would mean you don’t have older children. If you have older children, you’re not eager to write a book on parenting either. You see, books on parenting usually fall into one of two categories. The first category provides the theology of parenting. It is so ethereal and aloof that it is of no earthly good. It speaks in such broad tones that no parent in the battle for the hearts of their children could put it to good use. These books are well-intended, I’m sure. Moreover, there is a time for them to be read. However, in the heat of the parenting battle, you need something grittier. That’s the second category of parenting books. These are methodological books. They tell you how to parent. They seem wonderful because they answer all of your deepest and most troubling questions—that is until you try to apply them. When you do this, you realize that this book was written to teach parents everywhere how to parent the author’s children. They are significantly less helpful when applied to your children. Of course, there have been notable exceptions to these two categories. These are likely the books that grace your shelves and are recommended by you to others. However, overall, the more I parent, the less I want to read about how to parent. That may surprise you, but it is undoubtedly true. No, the more I parent, the more I want to read books about God. I want to know more intimately the God who is bigger than my weaknesses and more powerful than my children’s sin. 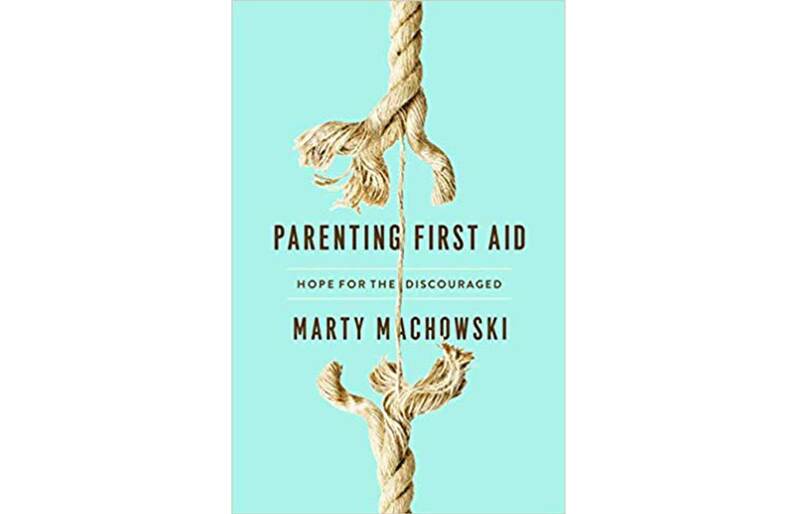 The more I parent, the more I want to read books like Parenting First Aid: Hope for the Discouraged by Marty Machowski. This book does not tell you how to parent. It doesn’t provide parenting tips such as “5 Steps to a Happy Home.” It doesn’t promise to create compliant teenagers or even to work on our kids at all. This book is written with parents in mind: parents who sometimes (often) fail to see and believe God in their parenting struggles. This book is written with a parent like me in mind. Parenting First Aid follows a well-crafted course of twenty chapters. Each chapter contains biblical teaching, followed by three days of devotions, each containing questions for discussion, prayer, and reflection. If digested slowly, it could take a reflective four months of time with a spouse. If done in a group, it could be 5, 10, or 20 weeks of fellowship. If the book is read front to back, it could take four hours. Allow me to recommend all of the above. Why such a strong recommendation? There are many reasons, but the first is by far the most important. This book leaves the reader with a sense of God. Too often, parenting books leave you with a sense of failure. They can make you wish you had the author as a dad or a mom and that your kids did, too. This only takes the reader to hopelessness, which doesn’t help our parenting much at all. Authorial genuineness drips from every page as this author has walked through the challenges about which he writes, which is not just insight a close friend has. Marty shares his story throughout the book, as well as other true stories of God’s faithfulness and mercy through challenges, failures, and disappointments. The picture painted throughout the book is one of reality. It is a challenging reality that all parents know. However, it is a glorious reality over which our holy and loving God is sovereign. Pick up Parenting First Aid for your own family. Pick up copies for those in the midst of the struggle and promote this book to your church to strengthen their faith in God. You’ll find these lessons, if well applied, will spill over out of the context of parenting, leading the reader to live with greater faith in our great God in other areas of their lives as well. Rob Flood serves as the pastor responsible for the marriage ministry at Covenant Fellowship Church. Additionally, Rob carries responsibility for Leadership Training, Women’s Ministry, and shares in the counseling of the church. He lives in West Chester with his wife, Gina, and their six children.